There\'s no wrong time to book this cruise though during winter the water may be choppy making tummies churn a little. We are comparing Venetian Lagoon Tour and Galleon Dinner Prices from leading ticket suppliers and Try to find you Cheap tickets prices on the market. 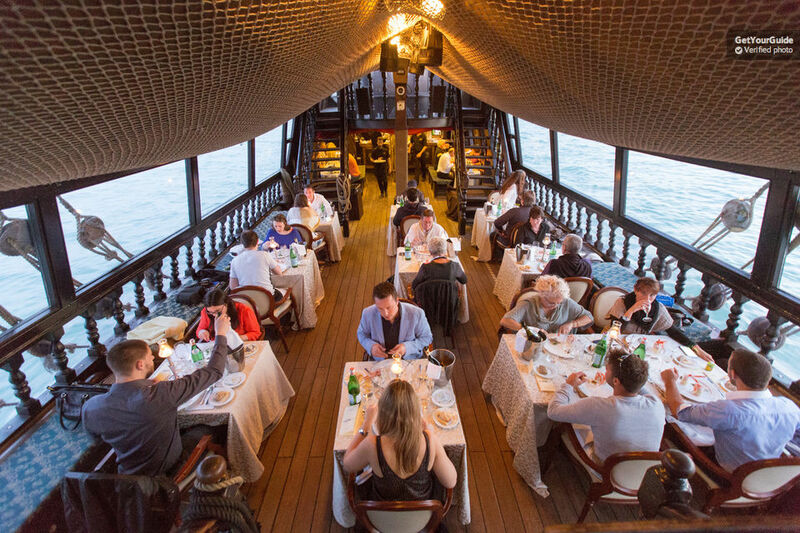 The galleon is an elegant old-fashioned ship that exudes luxury and charm. It\'s maximum capacity for guests is just 35 so you can be sure of an intimate atmosphere and top quality service. At the time of booking you\'ll be able to select where you want to sit choosing from the central deck which is more open and has panoramic views, the bow which has a more intimate atmosphere but lacks the view due to only two small portholes, or the poop deck which has small windows. There is an open deck where you can stand to get photos. All tables seat 4 people and during busy periods couples may have to share one of the large tables for 4. If you\'re looking for a sophisticated and romantic evening in Venice, this is for you! A beautiful way to see Venice at night, including its outer islands which are usually only seen during the daytime. The perfect way to celebrate a birthday, anniversary, or simply your time in Venice, the city of Love! There is a 5 course fish menu so make sure you like fish and seafood – An alternative menu can be arranged a head of time in case of allergies/intolerances/veganism. Not suitable for families who want to bring the kids – This is adult only time! Your Experience With Venetian Lagoon Tour and Galleon Dinner? Board the beautiful galleon dressed to the nines as you embark on a sophisticated 3 hour evening dinner cruise around the lagoon. You\'ll be given a warm welcome by the staff along with a glass of prosecco to get the evening off to a good start as you\'re seated at your candle lit table. As the boat sails through St Mark\'s Basin giving you stunning views of the piazza you\'ll be able to enjoy your starter. The ship passes some minor island, those of Sant\'Erasmo and San Francesco del Deserto before reaching Murano followed by Burano. As you\'re circumnavigating beautiful Burano you\'ll most likely be finished your main course of fish and enjoying dessert. The slow journey back to Venice, as you sip on after dinner coffee or enjoy another glass of wine, takes you past San Giorgio followed by a short ride up the Grand Canal past St Mark\'s once again so you can grab some more photos of this iconic place before disembarking full of smiles and laughter. What Venetian Lagoon Tour and Galleon Dinner Includes? 3 hour cruise around the Northern Venetian Lagoon area. Pay the extra and book your table on the central deck to be able to enjoy the views of Venice at night – The other seating areas have limited views meaning you\'ll be up and down during your meal taking photos on the outside deck. Travelers Reviews about Venetian Lagoon Tour and Galleon Dinner? Travellers talking about this boat trip on GetYourGuide and TripAdvisor rave about it, reviewers leaving 5 star ratings and fantastic reviews – It comes highly recommended. Everyone agrees that this cruise makes for a fabulous evening out on the water. The staff are friendly and helpful providing a first class service, the food is delicious, the boat delightful, and the views and experience as a whole something that will remain with them for a lifetime. This trip is wheelchair accessible. It is possible to board/disembark at Punta Sabbioni – Please request this ahead of time with the tour agency and wait for confirmation. In case of food intolerances, allergies etc. you must notify the cruise at least 48 hours in advance. The cruise takes place even during bad weather so long as there are 8 participants booked in – If less than 8 people book this tour it will not take place and you will be offered an alternative date or refund.